STOCKTON, Calif. - The Stockton Ports dropped their sixth straight contest on Wednesday night and three swings of the bat did them in. The San Jose Giants, who earned their first series sweep since 2017, hit three home runs that accounted for all six of their runs as they sent Stockton to a 6-3 loss to close out a 1-6 homestand at Banner Island Ballpark. San Jose got the scoring started early in the bottom of the first. Ports starter Mitchell Jordan (0-1) issued back-to-back walks to open the contest. After recording back-to-back outs, Jordan gave up a three-run homer to Ryan Kirby that gave the Giants a lead they would never relinquish. Stockton got two runs back while taking advantage of a Giants miscue in the bottom of the first. 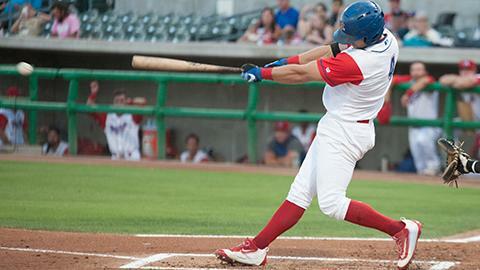 With two outs, the Ports loaded the bases on back-to-back singles and a walk. Jameson Hannah came up and would reach on a throwing error by Giants third baseman Orlando Garcia, allowing two runs to score and cutting the Stockton deficit to 3-2. It marked the sixth time in seven games the Ports have scored in the bottom of the first. The Giants pushed the lead back to three runs in the third when Kyle McPherson reached on a throwing error committed by shortstop Jeremy Eierman. Heliot Ramos followed with a two-run homer to right, the first of two homers for Ramos in the contest, to make it a 5-2 game. Jordan would suffer the loss, going four innings and allowing five runs on four hits while walking two and striking out three. Giants starter John Gavin would settle in after the first inning and pitch through the fourth. Gavin would not factor into the decision after allowing two unearned runs on three hits while striking out two. Ramos would strike again to lead off the fifth inning facing Ports reliever Jesus Zambrano. Ramos opened the frame with a towering home run to left to make it a 6-2 contest. It was the only run allowed by Zambrano as he went on to retire the next six batters he faced. Nick Highberger and Trey Cochran-Gill would combine to work the final three innings for the Ports without allowing a run. Clay Helvey came on to work the fifth for San Jose and pitched around a one-out single and a walk. In the sixth, Helvey allowed a leadoff single to Eierman. Two batters later, Jonah Bride drew a walk and Mickey McDonald lined a single to left to score Eierman and cut the Giants lead to 6-3. After JJ Schwarz walked to load the bases, Helvey was lifted for Olbis Parra (1-0) who got Nick Allen to fly out to shallow right and Lazaro Armenteros to ground out to shortstop to escape the jam unscathed. Parra would be credited with the victory after going 2 1/3 scoreless innings without allowing a hit while striking out one. Raffi Vizcaino (SV, 1) entered the game with one on and two out in the eighth and recorded a strikeout to end the inning. Vizcaino worked into the ninth and, with two on and one out, got Eierman to fly out to right and Hannah to strike out swinging on a 3-2 pitch to end the contest and earn his first save of the season. The Ports embark on their first road trip on the season on Thursday night when they travel to John Thurman Field to open a four-game series with the Modesto Nuts. Brady Feigl (0-0, 1.80 ERA) gets the start for Stockton, opposed by Modesto right-hander Austin Hutchison (0-0, 0.00 ERA). First pitch is set for 7:05 p.m. PDT.